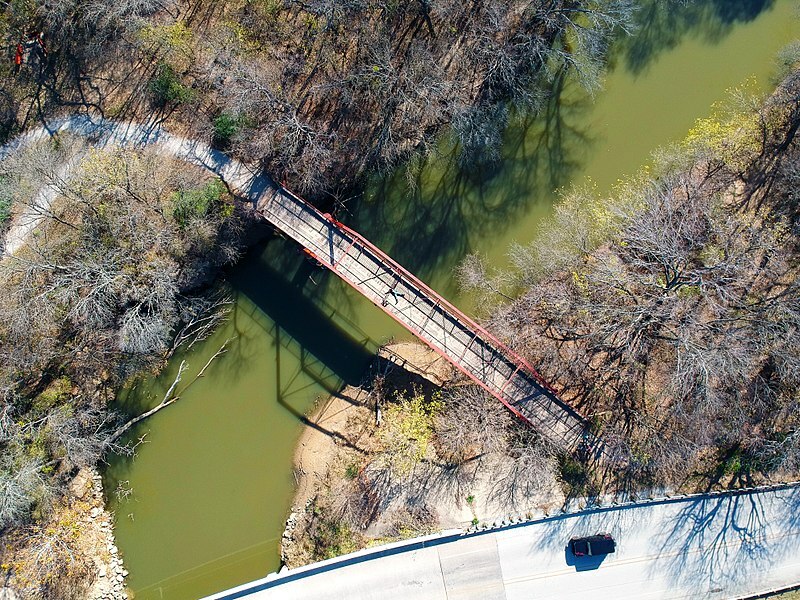 The Old Alton Bridge, or more famously known as The Goatman’s Bridge, is an old iron-truss bridge just Northeast of Dallas, Texas, near the now uninhabited town of Alton. The bridge and surrounding woods is said to be haunted by a demonic creature with the head of a goat and the body of a man. The bridge was completed in 1884 and spans over Hickory Creek, a tributary of the Trinity River. It was built near the small town of Alton and served as a trade link between the economic centers of Dallas and Denton. Alton served as the county seat of Denton county from 1851 to 1857, however it’s population was in decline as the seat was moved to the town of Denton. It was hoped that the bridge would bring new life to Alton, but it continued to decline and the community gradually disappeared. 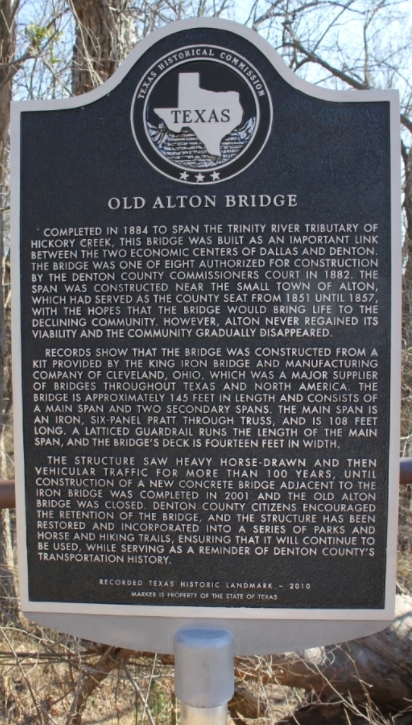 The Old Alton Bridge is about 145 feet in length and its wood-plank deck spans 14 feet in width. The structure saw horse-drawn carriage, then vehicular traffic for more than 100 years until a new concrete bridge, completed in 2001, was built adjacent to the old iron and wood structure. 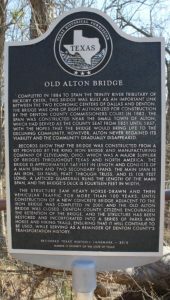 At this time it was closed to traffic, but the citizens of Denton county encouraged the county to allow the bridge to remain. It was restored and became part of a series of public parks and horse and hiking trails. Ku Klux Klansmen in the area were angered and jealous of Washburn’s success, and the sign only fueled their hatred. In the year of 1938, they ambushed him from his home in the middle of the night and dragged him to the Old Alton Bridge. Once there, they tied a noose around his neck, the other side of the noose to the bridge, then flung him over. When they looked over the bridge, all they saw was an empty noose swaying and undisturbed water in the creek below. The Klansmen frantically searched the area for Washburn, but were not successful in finding him. They made their way back to his house. Maybe to lure him out, or perhaps just for spite, they set his house on fire with his wife and children inside. His entire family perished in the flames and The Goatman was never found. Over the years, many have reported seeing a demonic apparition on the bridge that has the head of a goat, and the body of a man. 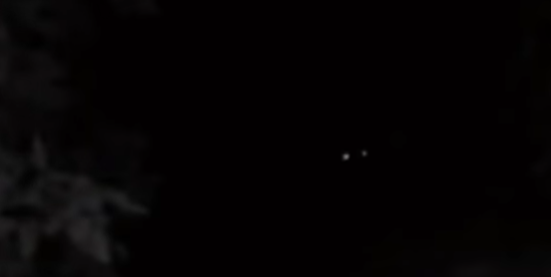 Its glowing red eyes are also reported to be seen in the surrounding woods. It is warned that knocking three times on the trusses of the bridge summons the creature. Although the tragic and disturbing story of Oscar Washburn has never been verified, one version of the legend says that since his disappearance, it is Washburn who haunts the bridge and surrounding area. Some say he will only appear to Klansmen or their descendants. However, the haunting may not be related to Washburn at at all. The Old Alton Bridge has been a hot-spot for satanic rituals. Locals have reported seeing groups of people in black robes with ritualistic candles on the bridge after midnight. For this reason, some think that The Goatman is a demon or evil spirit conjured by the satanists. Other entities and paranormal activity have been seen in the surrounding woods as well, ranging from apparitions to strange lights. A ghostly apparition of a woman has been seen on occasion. Some think is Washburn’s wife, looking for her husband, others not so sure. Her disembodied voice and laughter has also been heard echoing though the region. Other mysterious voices and sounds have been heard. A voice saying “Get off the bridge!,” has been recounted by numerous witnesses, as have the sound of hooves running across the bridge and through the woods. As you can imagine, the area has attracted numerous paranormal investigators and trill seekers through the years. The name “Steve” has been caught several times on EVP recordings and spirit box sessions although no attachment or incident to the name Steve has been found. Whatever entity, or entities, haunt the bridge and the surrounding area, they have also been known to physically effect people. People have recounted stories of being touched, pushed, or even scratched by unseen forces. One terrifying story tells of a person and his friend claiming to hear a voice tell them to “Get off the bridge!” He ran while his friend stayed. His friend was then dragged and toward the bridge’s railing and thown over the bridge into the creek below. People have also been known to have been overcome with feelings of rage, anger, and violence.